This collection brings together over 60 duets for every technical level by twenty-four composers from the 19th and early 20th centuries. This collection brings together nearly 100 works by Wolfgang Amadeus Mozart for solo piano, piano duo, and piano four-hands (excluding the concertos). This collection brings together over 400 piano works by the prolific virtuoso pianist and composer Franz Liszt. 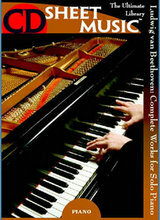 Includes original compositions as well as Liszt's many arrangements and transcriptions for solo piano. This collection brings together solo keyboard works by two important composers of the Baroque and Classical periods. Also includes helpful cross-reference for the various cataloging systems. This collection contains the wealth of solo and duo piano music by Edvard Grieg and Felix Mendelssohn. This collection features the numerous, varied works for solo and duo piano by Claude Deubssy and Gabriel Fauré.